The Clyde at Woodburn Lodges in Milton of Campsie, near Kirkintilloch, Glasgow and the Clyde Valley sleeps 6 people. 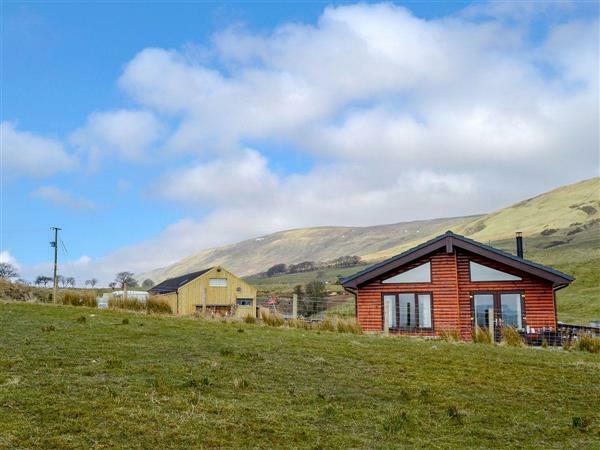 Woodburn Lodges near Kirkintilloch are situated in the foothills of the Campsie Fells; these lodges boast stunning views over open countryside. Set in 80-acres of open countryside and direct access onto the fells, the lodges provide a fantastic location for walkers and nature lovers and are a great base for exploring all that central Scotland has to offer. Fishing can be arranged via the owner at Woodburn Fishery and also outdoor sports such as clay pigeon shooting. The Clyde (ref UK5758) has a lovely decked area from which to admire the stunning views while The Spey (ref UK5757 [The Spey]) has a private hot tub on the deck. Loch Lomond and the Trossachs National Park is 20 miles away with walking, cycling, fishing, golfing, horse riding and water sports on offer. Loch Lomond and its inland waters are famous as one of the finest water sport venues in Scotland, with open spaces, sheltered bays and islands to explore. The area holds a magnificent diversity of scenery with dramatic peaks, waterfalls, hidden caves and mysterious forest covered slopes. The city of Glasgow with galleries, museums, historical attractions, superb nightlife and fantastic shopping is a 20-minute drive, or you can easily catch a train. Stirling and Edinburgh are also easily accessible. The shop, pub and restaurant are 2 miles from Woodburn Lodges near Kirkintilloch. The Clyde can be booked together with The Spey (ref UK5757 [The Spey]) to sleep up to 12 people. The Clyde is all on the ground floor. Living area: With wood burner, 42 Freeview TV, DVD player and French doors leading to decking. LPG central heating, gas, electricity, bed linen, towels and Wi-Fi included. Initial logs for wood burner included, remainder at an additional charge per basket. Travel cot and highchair available on request. Welcome pack. Decked sitting-out area with garden furniture. 80 acres of natural woodland (shared with other properties on-site). Bike store. Private parking for 2 cars. No smoking. Please note: There is an unfenced stream in the grounds, 10 yards away. Holidays at The Clyde, Woodburn Lodges run from Friday to Friday. Pets allowed at Woodburn Lodges - The Clyde. For a better idea of where Woodburn Lodges - The Clyde is, you can see Woodburn Lodges - The Clyde on the map below. Woodburn Lodges - The Clyde is in Lanarkshire; should you be on the lookout for a special offer, you can find all the special offers in Lanarkshire. It's always worth checking to see what is on offer at the moment. Do you want to holiday near Woodburn Lodges - The Clyde (UK5758), you can see other cottages within 25 miles of Woodburn Lodges - The Clyde; have a look to find your perfect holiday location.